Fair Chase Hunting: Good news about hunting. Yes, actual good news! Well, hot diggity, the preliminary numbers are out and the number of hunters in the U.S. has increased over the past five years. The numbers come from the mammoth U.S. Fish & Wildlife Service's 2011 National Survey, which I've found to have the most reliable numbers (i.e., biggest sample size and lowest margin of error) on hunting in America. Total hunter numbers up 9.6 percent. 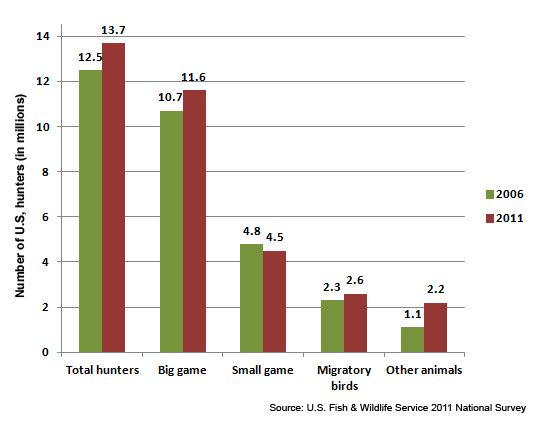 Big game hunters up 8.4 percent. 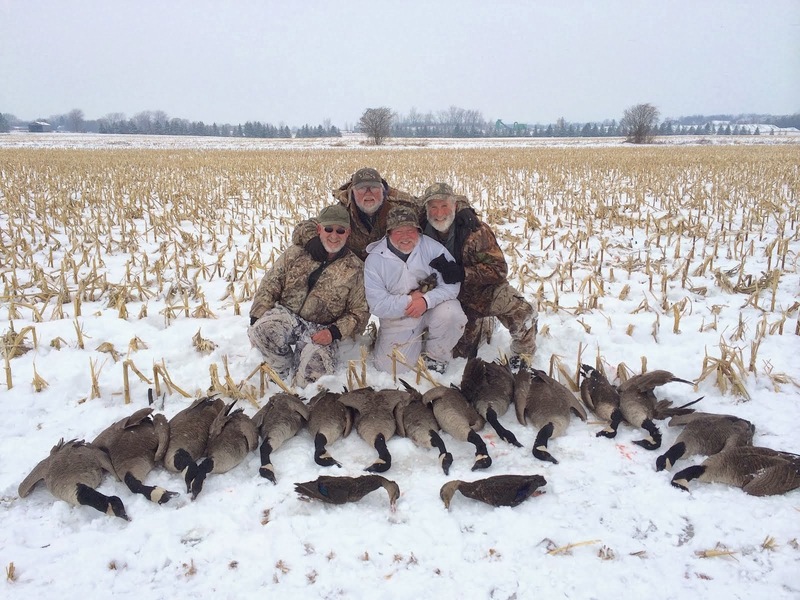 Migratory bird hunters up 13 percent. Hunters of other animals up ... wait for it ... 100 percent! The only number that dropped was small game hunters, which were down 6.3 percent. Good. More rabbits for me. This is as much detail as USFWS has released so far. There's no breakdown yet for the numbers of kids, women and various ethnic groups hunting. The 2006 survey showed that the number of girls 15 and younger who hunt had nearly doubled over the previous 15 years, so there are a lot of potential gems in the 2011 numbers. But unless FWS has changed its survey, we won't ever see answers to what is, to me, the most important question: WHY? From where I sit in Northern California, I can tell you we're seeing a huge interest in hunting from non-traditional groups, primarily urban foodies (often liberal) who are trying to opt out of the factory-farmed meat supply. Thank you, Michael Pollan, for sparking that interest with "The Omnivore's Dilemma." But I haven't yet seen any data that would back up that anecdotal evidence with real numbers. I also can't ignore the fact that the Great Recession may have sent more people into the field just to put meat in their freezers. It might not have anything to do with the noble aspirations of foodies. The other question the National Survey won't answer is what is the upshot of this increase? I hope it means that support for hunting is on the rise. More people hunting = more non-hunters being exposed to hunting = stereotypes getting crushed. I see that personally. Hell, I live it - I'm a female college journalism professor, and when non-hunters find out I hunt, they're almost always surprised, and they almost always walk away with an image of hunting that is no longer the caricature peddled so effectively by the Humane Society of the U.S. But realistically, the only thing we can assume with reasonable safety is that rising hunter numbers means rising revenue for, and interest in, conservation. That's a good thing. Thanks for posting the survey results, Holly. It's a ray of hope for sure. In my neck of the woods, "small game" numbers have been declining for years. I suppose that those geezers running dogs with sweetly tinkling bells get discouraged by the scarcity of grouse in nearby "edge" (actually, we have a scarcity of "edge"), and the beaglers by the scarcity of cottontails, and just fade away. OTOH, young people with iPhones and Skechers are not personally acquainted with The Gnarlies. Finally, I note in case it isn't obvious that the survey must have asked each subject whether (s)he hunted big game or small game or migratories or other animals, thus allowing for multiple "yes" responses. Otherwise the whole isn't equal to the sum of its parts. 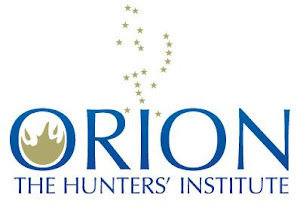 So I'd like to see a further breakdown of the data to see how many hunters are "specialists." Probably people just getting back into it. I suspect the up tic is a bunch of things coming together and finally yielding results in higher hunter numbers. 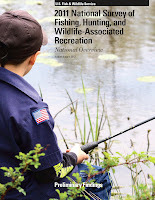 The things you articulated plus programs like Families Afield (lowering barriers to hunting especially high age restrictions), Becoming An Outdoors Woman, special youth hunting seasons for deer, waterfowl and turkey, apprentice licenses (try it you may like it), home study/online & field day hunter education training, and the growing interest in hunters to mentor new hunters. Also the abundance of game, even over abundance in some areas of deer and geese, has to be helping. I especially welcome the increase in female hunters. As a former game warden I found that guys hunting with women behaved way better than a bunch of guys on there own. The key to a sustainable future for hunting is when the public looks at the majority of hunters and says, "Those folks really know what they are doing, not only do they bring home great healthy food, but they work to conserve wildlife and wild places for all of us." "As a former game warden I found that guys hunting with women behaved way better than a bunch of guys on there own. " Same experience here with what I've encountered. If it's a woman alone or group of women(rare, but I've seen it) then no chance of purposeful bad behavior. If it's a guy(s) with a woman (en), little chance. If it's a group of guys, 50/50. If it's a married single guy, 50/50. If it's a single guy who is single, high chance of bad behavior. Unfortunately, I've also seen the same ratios during youth and when hunting with youth. The fact that the kid is with them, doesn't seem to stop the parent from poor behavior. One can also profile just on state of vehicle. New clean car, then little chance of bad behavior. Beat up old car, all bets are off. Generally I guess it's the case where if you have something to lose, you are more cautious. If you have nothing to lose, you just don't care. saya suka sekali artikel postingan ini sangat membantu. Hallo apakabar sobat? Moga baik-baik aja ya.. disini Ane sekedar mau share saja tentang Obat Aborsi yang banyak beredar di dunia maya dan juga banyak sekali peminatnya di bandingkan aborsi dengan cara melakukan operasi. Karnanya menggunakan Obat Aborsi ini cukup murah di bandingkan dengan cara yang lainnya. Terima kasih atas luang waktunya untuk membaca tulisan ini, dan semoga bahasan tentang Obat Aborsi ini bisa bermanfaat bagi kita semua.